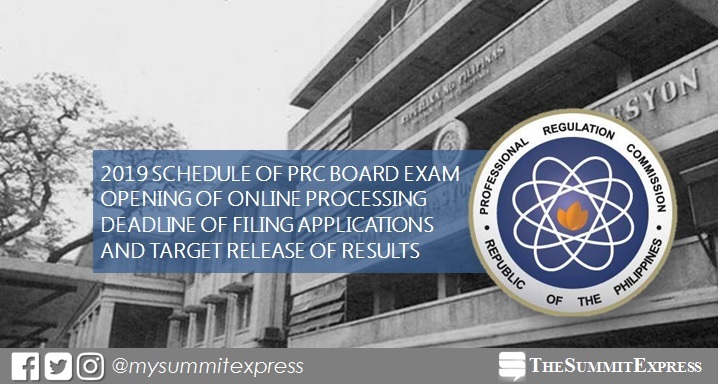 MANILA, Philippines – (Updated January 10) The Professional Regulation Commission (PRC) officially released on Wednesday, November 28, the schedule of board examinations for 2019, which includes the opening of online processing, deadline for filing applications, practical examinations, professional upgrading examinations, Special Professional Licensure Examinations (SPLE) and target dates of release of examination results. The SPLE to Overseas Filipino Workers for 2019, shall be scheduled in accordance to PRC Resolution No. 2011-627 pursuant to R.A. No. 8981 and Executive Order No. 835.